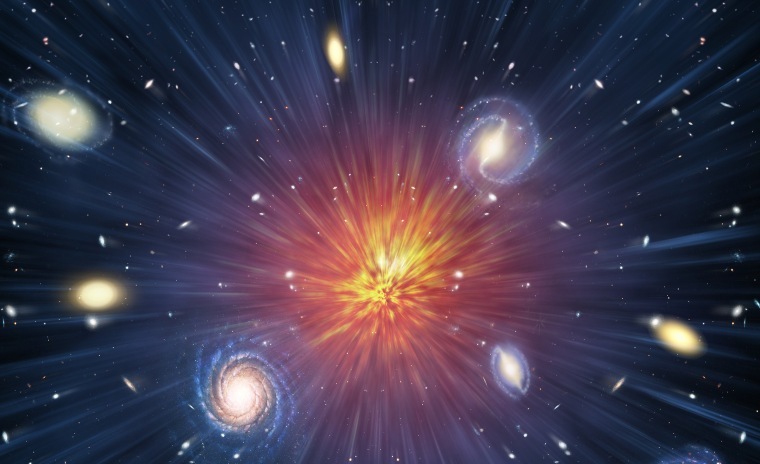 Controversial theory holds that the Big Bang was simply one of many. Scientists agree that the story of the universe began 13.8 billion years ago, when everything — all the matter and energy and even space itself — emerged from the extraordinarily hot, dense cauldron known as the Big Bang. But ask a scientist what came before that first moment, and you’re likely to get a shrug. To many, thinking about a time before the beginning of time makes no sense. Roger Penrose isn’t one of them. For more than a decade, the University of Oxford physicist has been honing his theory that the Big Bang was not the beginning of the universe but merely a single stage in an eternal cycle of creation and recreation. And now he claims he has the evidence to back it up. In a new paper posted to the preprint library arXiv, Penrose and two collaborators report that they've identified strange hotspots of energy in the sky, located at the edge of the observable universe. Standard cosmology doesn’t predict these features. Cyclic cosmology does. “I originally put this model out there as an outrageous scheme, a crazy scheme,” Penrose confesses — and some of his colleagues readily agree with that assessment. “I am highly skeptical of cyclic cosmologies no matter what flavor they come in,” Caltech physicist Sean Carroll said in a blog post, reflecting a common sentiment. Penrose points to the sky itself as his rebuttal. If he's right, the cosmic hotspots are relics of a universe that existed before our own. That would utterly change the way we think about the universe's origins and ultimate fate. “In cyclic cosmology,” he says, “there is no beginning, and nothing is lost." When Penrose calls his ideas outrageous, he isn’t kidding. According to his “conformal cyclic cosmology” model, we’re in the early stages of a grand cosmic era, or aeon. The universe will continue to expand at an accelerating pace for hundreds of billions of years, or perhaps a great deal longer — certainly long after Earth is dead and gone. In that far-off future, the universe will have expanded so much that space will be nearly empty, dominated almost entirely by energy and radiation rather than matter. At that point, Penrose argues, “mass” as a property of matter will fade away. The widely scattered particles that remain will become massless ghosts, leaving the universe with no recognizable structure. Sound strange? “Well, it doesn’t seem strange to me,” Penrose laughs apologetically. Now comes the truly confounding part. Once the fundamental touchstones of mass and structure disappear, scale also disappears. The infinitely large universe becomes physically identical to an infinitesimal one, and is reborn in a new Big Bang — with all the mass and energy of the previous universe once again jammed together into a tiny space. The new universe would be a clean-sheet version of the preceding one. It would have the same kinds of matter and physical laws set loose to create a completely new set of galaxies, stars and planets. “The next universe will be just like ours — but only in overall appearance, not in detail, of course,” Penrose says. But while people and objects can’t cross over, energy can. That is how Penrose thinks he sees signs of what has come before. In Penrose’s new paper, co-authored with physicists Daniel An of SUNY Maritime College in New York and Krzysztof A. Meissner of the University of Warsaw, he investigates the fate of pockets of energy from a hypothetical previous universe, such as might be created by black holes. When an old universe crosses over to a new one, the scientists argue, the pockets are squeezed into dots of concentrated energy. Penrose calls those dots “Hawking points” in honor of famed theoretical physicist Stephen Hawking, his former colleague and collaborator. According to cyclic cosmology, these points should be detectable as bright spots in the cosmic microwave background, an all-pervasive glow created when space was still red-hot from the Big Bang. Sure enough, when Penrose and his team scrutinized astronomical maps of this radiation, they found “powerful observational evidence of anomalous individual points.” To him, this could be the blazing-gun evidence of a universe that existed before ours. Penrose has made similar claims before, only to see them shot down. The microwave background is full of random features, his critics noted, and it’s all too easy for the eye to discern patterns where none exist. So this time Penrose asked An, his co-author, to compare the real universe to computer simulations of what the universe should look like according to conventional theory. If Hawking points are real, they should show up only in the genuine data. If they are illusions, they should show up in the simulations, too. Despite all that, Penrose's ideas are still greeted with skepticism. Douglas Scott, a University of British Columbia physicist who had disputed some of Penrose’s earlier claims, is dubious about this one, too. “I would love for there to be evidence for a previous cosmic aeon, but it needs to be much better than presented so far,” he says. Penrose acknowledges that his theory clashes sharply with mainstream thinking. But as an 87-year-old physics legend with nothing to lose, he happily presses on, looking for proof that will win over his critics. One idea is to search for indications that particles can spontaneously lose their mass, as he predicts. He is also developing more detailed predictions about distinctive patterns that might show up in the cosmic microwave background. Above all, Penrose wants his colleagues to open their eyes to the possibility that we might be able to observe evidence of what came before the Big Bang. “It changes many things in one’s attitude,” he says, opening up for study a vast prior history of the universe. It would also shake up a field that, in his estimation, could use some shaking up.